What are you going to do when the world ends? It’s a great question that just leads to more. What are you going to do? Who are you going to do it with? How long until you go insane? And just what is going to drive you over the edge? Most often we think it is going to be a reckless, wild ride like MAD MAX: FURY ROAD. In reality, it will be one long descent into something that very much resembles anarchy, and Emiliano Rocha Minter is more than happy to take us there with his latest film WE ARE THE FLESH. The movie opens up with Mariano, played by Noé Hernández, doing what can only be described as surviving in a disheveled building. We see him eat, construct crude structures, and preoccupy himself with drugs and other meaningless activities. That is until two siblings arrive. They stumble into his world, not quite knowing what to expect, and eventually, he offers to take them under his wing. The group form an unholy trinity of terror. What happens next is an intense descent into madness quite unlike any other. The movie, from the outset, is mostly driven by a tour de force performance from Hernández. It’s intense, nuanced, and manages to encapsulate the pure insanity that is at the soul of this film (pretty sure he studied Charles Manson fairly close for this role). While this is Minter’s first full-length feature he deftly captures this performance and the world with the skill of a master craftsman. For all of the chaos on display in this film, there is a deft focus that allows the viewer to get sucked into this strange and ugly world of lost hope and raw sexuality. Not deserving less credit is Maria Evoli and Diego Galamiel. They play the unnamed sister and brother respectively and give unwavering performances. 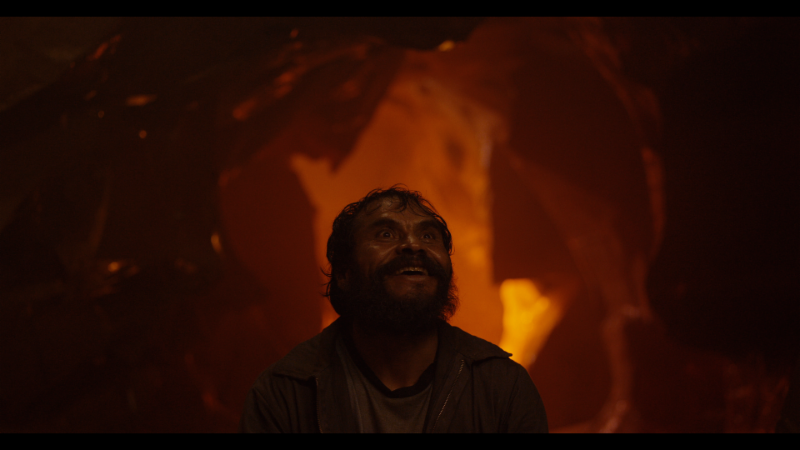 Evoli, in particular, shines, matching Hernández in terms of displaying intense emotion as well a character that is unbound by the limits of sanity. However, going back and saying “the movie is crazy” is a disservice to the shear talent on display here. It plays with themes of religion, sexuality, family, and violence in ways that would make Game of Thrones blush. If you can tell, I liked the movie. On the other hand, I can see why some others may not. This is not an action-packed thrill ride, but more a deeply intense exploration of the dark side of the human condition, and it’s very art house execution may turn some viewers off or leave others confused, or absolutely disgusted. I, however, was able to sit back and drink in a unique, dark film that got me thinking about questions whose answers I didn’t want to know. Sometimes it doesn’t hurt to let yourself get seduced by chaos. Next ArticleJAMES CAMERON'LL BE BACK: THE END OF THE TERMINATOR FRANCHISE?